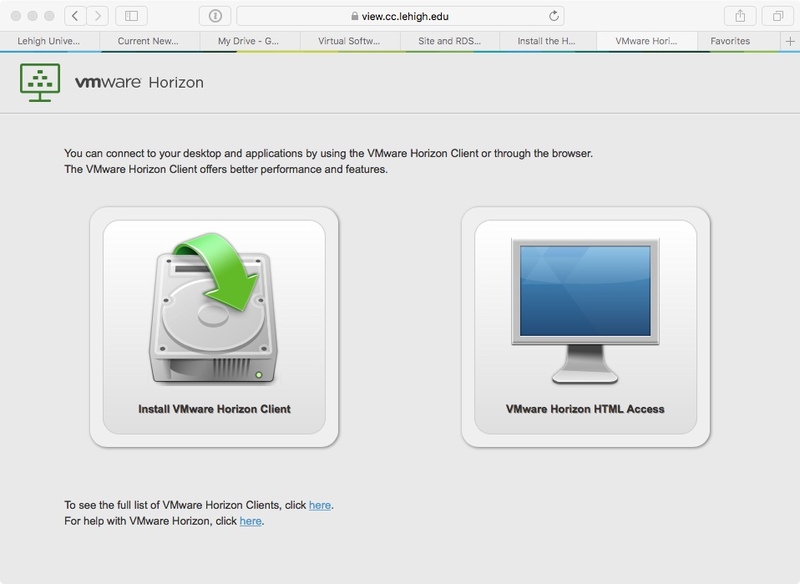 The following instructions guide users on installing the VMWare Horizon Client software, which is used to access virtual software provided by LTS. The instructions assume that you have internet access and appropriate permissions on your device to install the software. The example system tested is running Ubuntu 16.04 with it's standard desktop GUI. Open a web browser, and navigate to 'https://view.cc.lehigh.edu'. You should see a large icon titled 'Install VMWare Horizon Client'. 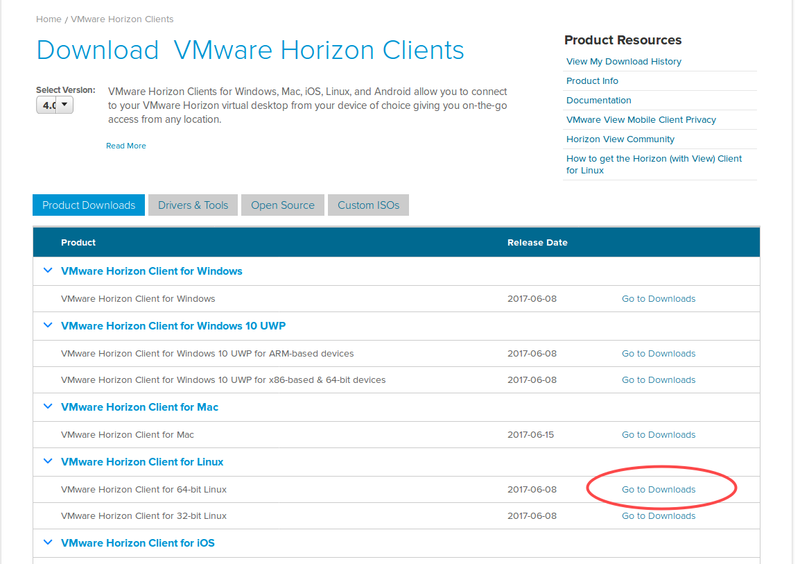 Click on this to be taken to the VMWare Horizon Client downloads page. 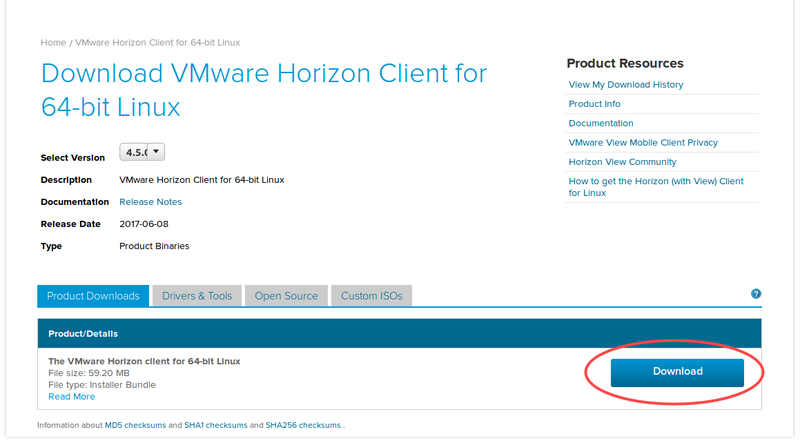 On the VMWare Horizon downloads page, find the download link for your operating system. In this example, we've selected the 64-bit client for Linux, and click on 'Go To Downloads'. 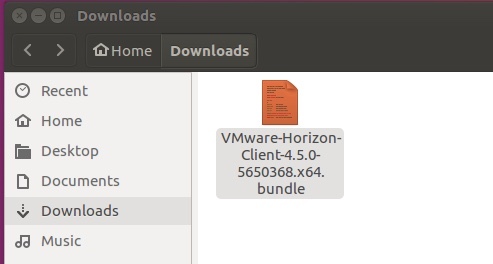 Verify that the installer file downloaded -- It will have a name like "VMWare-Horizon-Client-4.5.0-5650368.x64.bundle". Open a terminal, and navigate to the directory to which the installer was downloaded. Probably a command like 'cd Downloads' will do this correctly. Set the file permissions to allow it to be executed as a program using a command like "chmod a+x VMWare-Horizon-Client-4.5.0-5650368.x64.bundle". Then, run the installer program with administrative rights with a command like "sudo ./VMWare-Horizon-Client-4.5.0-5650368.x64.bundle"
Page through the User License Agreement by pressing the '<space>' key to advance pages, and, finally, 'q' to quit the reader. Generally, accept the default values by typing 'yes' and / or hitting '<enter>'. When the installation is finished, you should see output indicating it's success. Once it's installed, you should be able to start the client from the desktop environment by searching, and clicking on the program icon.